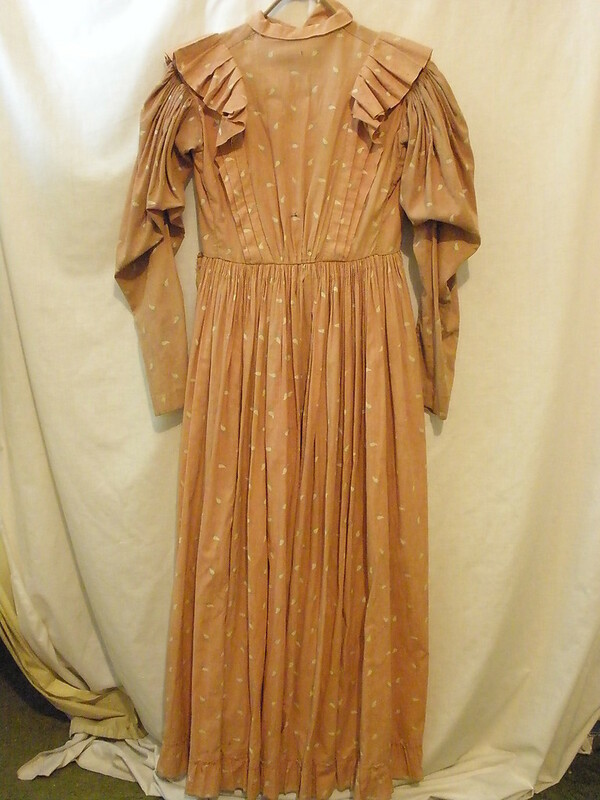 This dress most likely dates from the mid to late 1890's. The leg-o-mutton sleeves are a key trait in women's clothing in the 90's. Also, the back of the skirt is tightly gathered and then sewn or gauged to the bodice which creates back fullness. First of all, the color is completely faded and uneven. In some of the close-ups, you can see pink spots that are on the sleeves, bodice, and skirt. I believe that these are the left-over areas of the dress' original color. 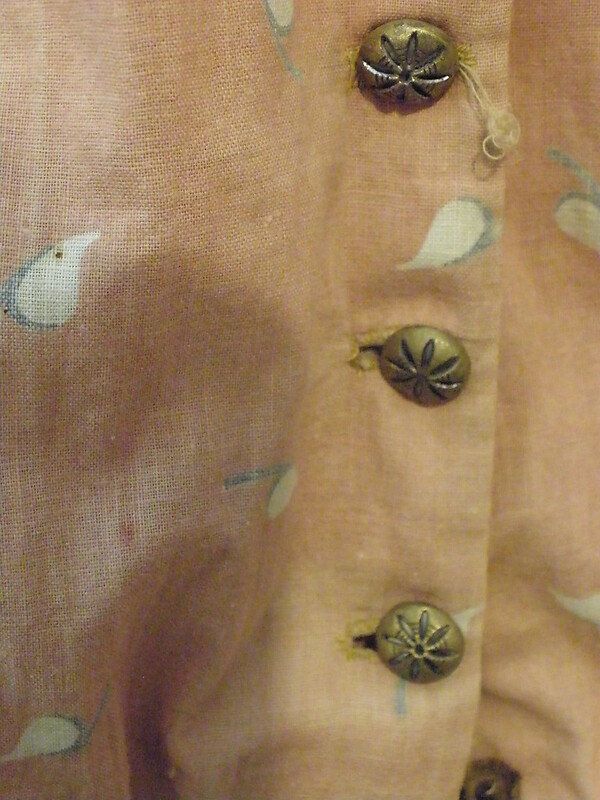 There are three different types of buttons on the bodice. There are apprx. one dozen or more brown spots on the front and back of the skirt and about 2-3 dozen pinsized holes. 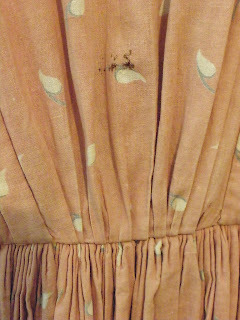 A small group of brown spots on the back of the bodice near the waist. 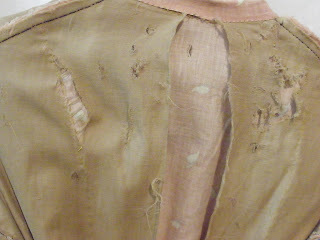 The cotton lining on the inside of the bodice is completely rotted and falling apart. The very edge of the skirt is mildly stained all around. It is free of the bad smells usually associated with Victorian clothing. 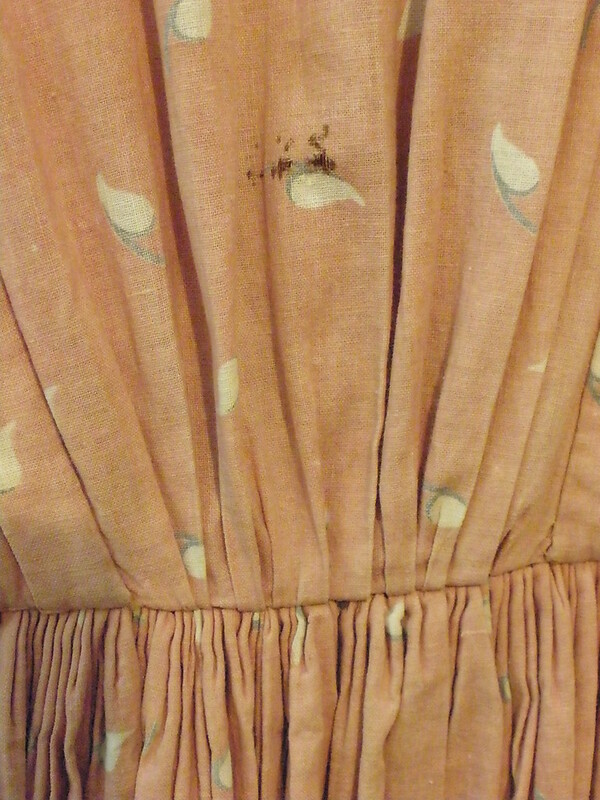 The fabric is still stable and free of dryrot. 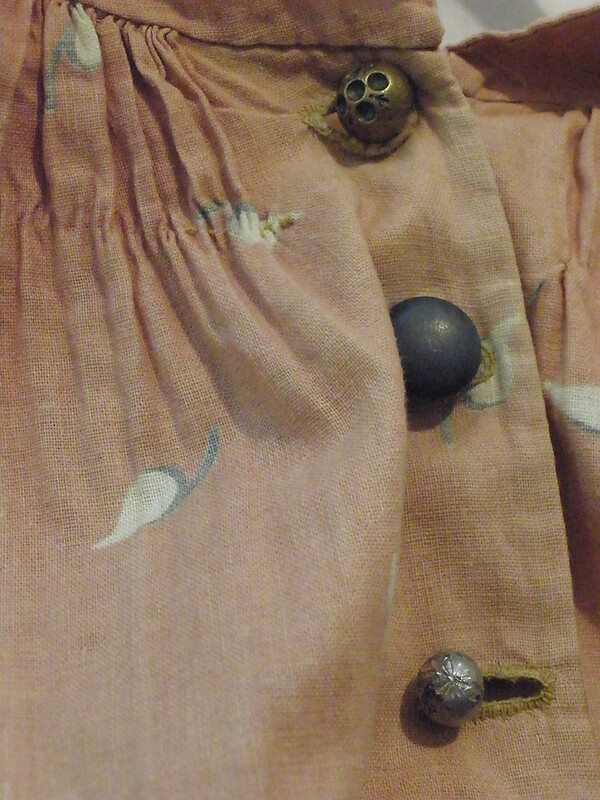 There is a lot of material in the skirt. 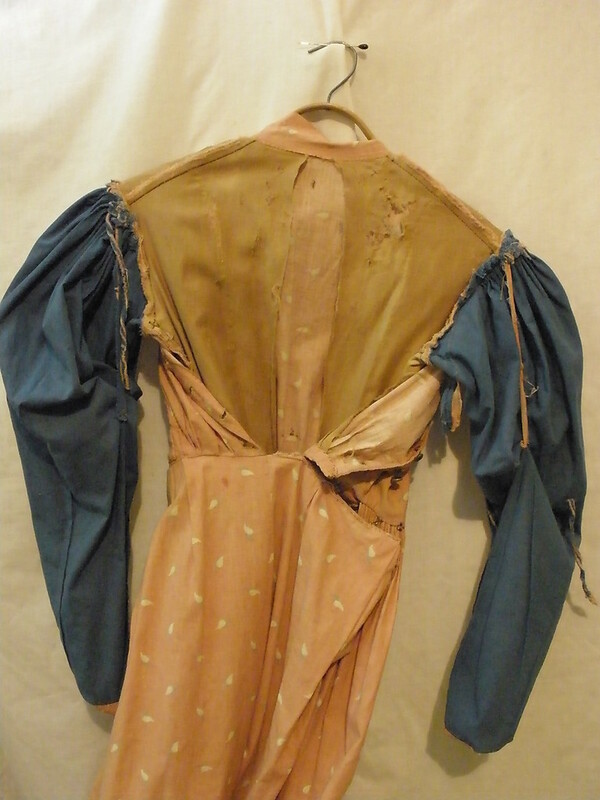 The blemishes are small, and the fabric could be used to make a historically accurate costume for a child or even a doll. The fabric is faded, but it has become a very pretty and soft pink with cute floral pattern. I have taken measurements to help determine a proper fit. The flat bust measurement is 17". The waist measures 27". The length of the sleeve from the shoulder seam to the cuff is 23". 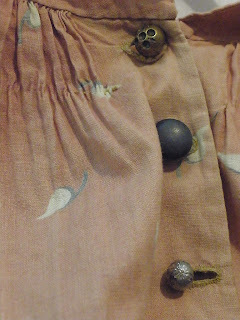 The length of the skirt from the waist to the hem is 39". The lengthen of the bodice from the shoulder seam to the waist is 14". The length of the dress from the top of the shoulder to the hem is 53". It's not Victorian and it's not from the 1890's. I know that even I have said "big sleeves = 1890's" but that isn't always true. It sometimes means 1830's. And that is what this dress is. 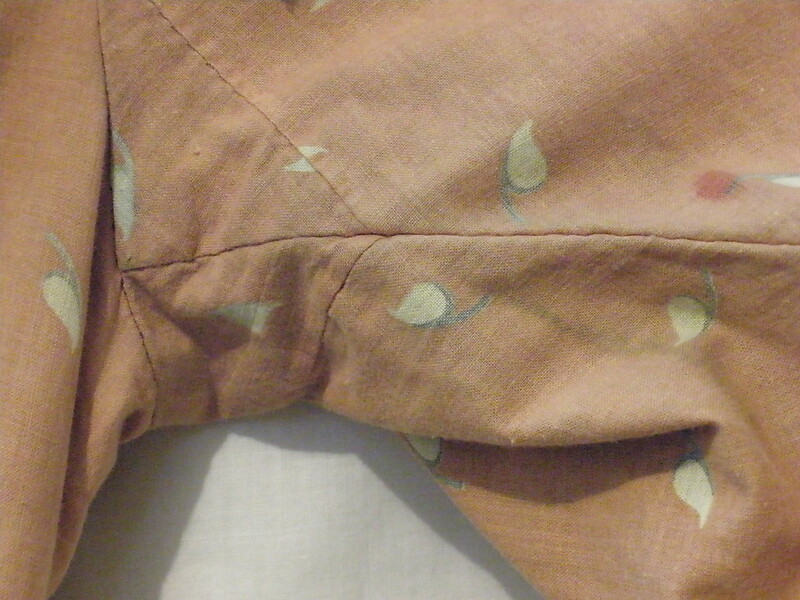 If you look closely at the stitching, you can see it's all hand sewn - clue one. (yes, there were hand sewn dresses in the 1890's because not everyone could afford a sewing machine but it is a helpful hint that the dating may be off in this case.) The sleeves are not puffy up top - meaning that the sleeves aren't meant to go above the shoulders as you see in Leg o'mutton sleeves, but that they are meant to go out from the upper arm. 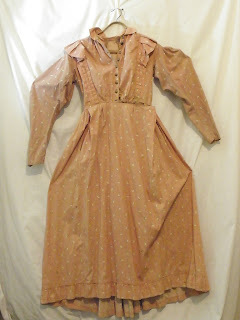 (Horizontal puffs - 1830's/ vertical puffs - 1890's) The waist looks a bit high for the 1890's and isn't pointed as most 1890's dresses were. 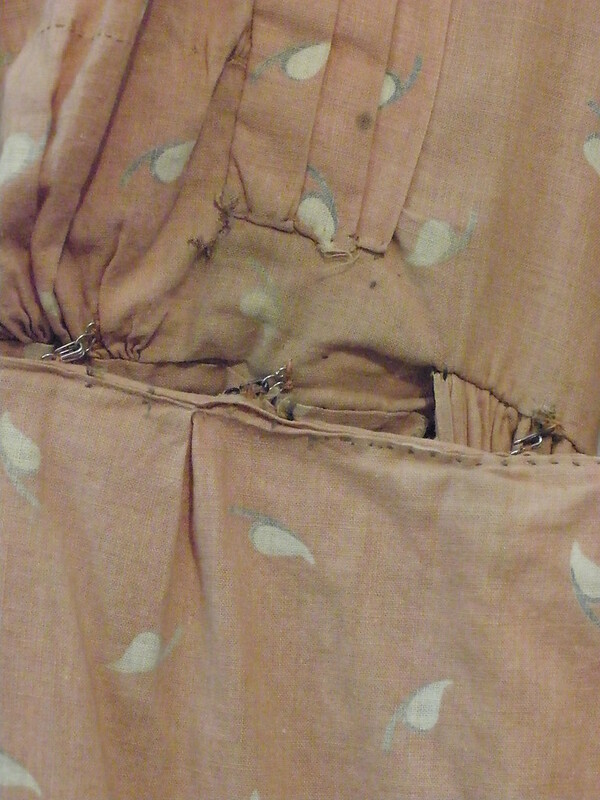 Also, the skirt and the bodice are held together with hooks and eyes - something that became uncommon past the First Bustle Era. The slope of the shoulders (evident when the dress is turned inside out) is also more consistent with the late 1830's (I think this is from about 1837) than the 1890's. Blue dress with ruffles on the sleeves Her ruffles are lower than our dress but they certainly had them. I also like that the shoulders aren't as sloped as we typically see this late in the 1830's. Another with her shoulders not quite as sloped as we typically expect The shoulder sloping gets bad when the 1840's come around.